The lower section of Apricot Crisp is in good condition and ready for use. Trail is closed to equestrian use until June 15 to allow the trail surface to harden. Upper Apricot Crisp will remain CLOSED to allow protection for wintering mule deer in the forested area along Fairview Ridge. Please respect this closure as we wait for the mule deer to move to higher elevations. This trail is in the upper elevations of the Horse Lake Reserve and meanders through some wonderful wildflower patches, big fir trees, viewpoints of the Cascade Mountains, and birding territory. The trail can be reached by following the Old Ranch Road from the gate, or by taking Homestead Trail to where it connects to the Old Ranch Road. About a quarter of a mile past where the Homestead Trail connects to the Old Ranch Road, you'll see the trail taking off to the left, just before you enter a big open field. The trail is in two sections: a lower section that is a mile in length, and an upper section that is 3/4 mile long. How did Apricot Crisp get its name? 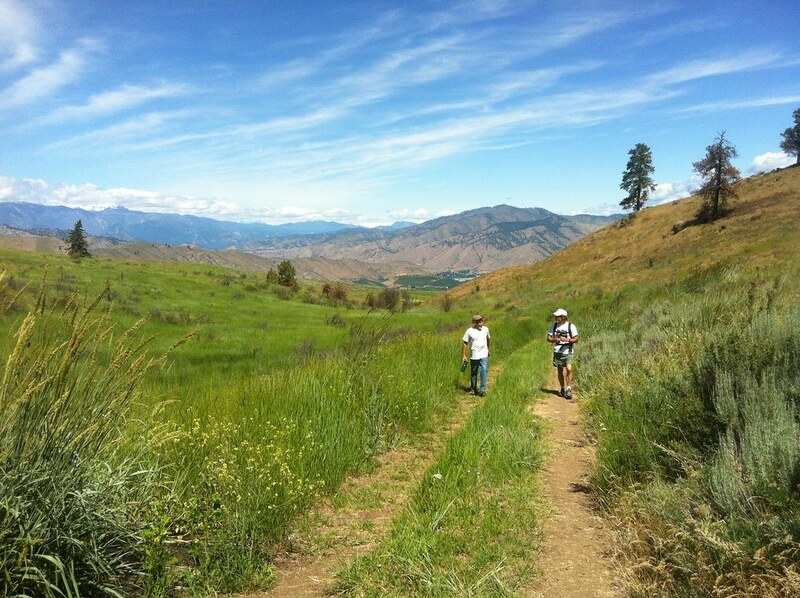 The trail was originally designed and slated to be built in the fall of 2012, connecting the Horse Lake bed to an old apricot orchard higher up in the property. It was going to be a mellow, fun, smooth trail--and so the name was Apricot Smoothie. But when the fires came through in September of that year, the orchard and many other areas were scorched, and building the trail was postponed until spring of 2013. It seemed appropriate to change the name to Apricot Crisp! This trail is in the upper elevations of the Horse Lake Reserve and meanders through wildflowers patches and big fir trees, and has great views of the Cascade mountains. About a quarter mile beyond where the Homestead Trail connects with the Old Ranch Road, you will see the Apricot Crisp trail take off to the left, just before you enter a big open field. It will reconnect with an old road after about a mile; follow this road about 300 yards uphill (to the left), and the trail will take off again on the right side of the road.